Technoland is where you can experience the fun in crafting, lining up original playing tools with principles and mechanisms employed in textile machinery and automobiles. A kids’ area for younger children and a children’s library are also attached to the facility. ※All preschoolers must be accompanied by a guardian when entering the facility. ※There may be some cases where limits are placed on experiential attractions or the duration of visit when the facility is busy. ※Please note that entry numbers will be controlled in advance by the reception area during busy periods such as weekends, national holidays, and summer and winter holiday weeks. You feel the force of air flow whenever you stand in the wind or run. The force that offsets the airflow and prevents you from being blown away is called air resistance. This specially constructed wind tunnel allows you to experience the wind speed, and the relationship between the shape of objects and air resistance. The wind speed and air resistance are displayed on the wall, and visitors can see the changes in resistance as they change their posture such as standing, squatting, and extending arms. Feel the changes in resistance as you change your posture. 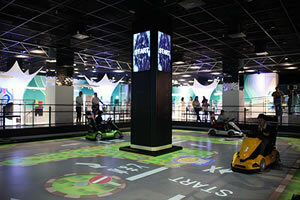 You can experience the basic automobile operation of driving, turning, and stopping by driving a toy car on the course displayed on the floor panel. Automobile brakes stop the wheel in motion using friction to reduce kinetic energy. Common brake structures include drum and disk brakes. The differences between these two brake systems are explained here. Visitors can press their hands against the rotating unit and feel the heat generated from the friction. In a gasoline fueled engine, fuel and air are mixed, compressed, and ignited to create an explosion that converts combustion energy into continuous cycle of rotary motion. In order to produce this explosion continuously and efficiently, ignition timing is very important. Visitors will compete for the level of acceleration by aiming for the most appropriate ignition according to the engine rotation. At Trans MISSION, children can realize the need of transmission because adjusting speed is difficult without selecting appropriate gears for low speed or high speed. If the humidity is low on a midsummer’s day, you feel cold when you come out of the water after a swim, even though the temperature is high. This happens because in the process of evaporating, water droplets draw heat from your body. Air conditioners and refrigerators make use of this same principle. On the screen, the basic principles of weaving are learned by manually stepping on a pedal or treadle, which is linked to the screen. It opens the two warp sheets, and then the weft is inserted and beaten, showing of processes from the thread to the completion of the fabric. You can learn about the basic principle of the weaving with the weft crossing over and under the warp to create a crisscross pattern. Weaving is the crisscrossing of warp and weft at right angles. The orderly over passing of the weft to the warp produce the pattern of the fabric. There are three-types of weaving such as, plain, twill and satin. At this weaving table, visitors can try different types of weaving by considering how to use the weft and also try making patterned fabric. One of the weaving machines is a Water Jet Loom powered by high pressure water jet. This principle is used in the game to hit the mark with the weft. Players can feel the power of water under high pressure. Another weaving machine is the Air Jet Loom powered by high pressure air jet. This principle is used in a game to move a ball instead of thread. Players can feel the power of air under high pressure. This is an area where younger kids can enjoy playing. You can climb up and pass through under, maneuvering up, down, left, and right. The entire space is fully utilized for playing tools filled with physically and mentally stimulating activities. Children of 0 – 2 years of age can play in the Hai-Hai (crawling) area with their guardians. It is a library area for younger children up to around second graders. You can commune with books while children are reading together, or parents are reading to their children. Books, especially picture books from various genres, are collected.